For our residential clients, we take the time to make sure you understand why the survey is needed and explain our step-by-step approach to documenting your project. For our commercial clients, we have invested in technology for dependable accurate surveys with a reputation for meeting aggressive schedules. At Johnson-Western Surveying, we embrace being part of the team to deliver projects from concept to completion. Johnson-Western Surveying, LLC gauges success by delivering quality residential and commercial land surveying services at fair and competitive prices. With 24 years experience, we deliver projects accurately and on-time while working to exceed client expectations. Rain or shine. Any season. 2500 BC: Land surveying has been practiced since humans began erecting structures. It arose from the increased need to map property boundaries for the political, economic, and social needs of society. The Egyptians use surveying to erect the Great Pyramids and rework the boundary lines when the Nile overflowed its banks. The Egyptians invented many surveying tools whose design is still in use today. 1620 AD: Gunterâ€™s Chain was introduced by mathematician Edmund Gunter to more accurately measure distances: 1 Chain = 66 Feet. 1816 AD: Congress established the Office of Surveyor General for Illinois and Missouri. 1831 AD: The Illinois surveyors reached the northern boundary line, nearly 30 years later. Surveys were conducted by manually measuring distance using the Gunterâ€™s Chain. 1833 to 1837 AD: Abe Lincoln served at deputy surveyor. 1843AD: Illinois survey was complete. 1850 AD: The first American female surveyor, Alice Fletcher, allotted Indian lands. 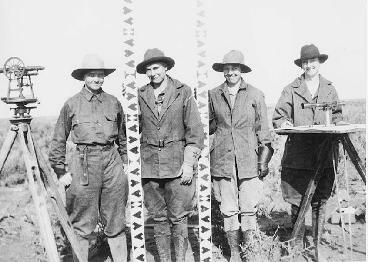 1918 AD: The first all female crew worked on the Minidoka Project in Idaho. The Minidoka Project is one of the oldest Bureau of Reclamation projects in the United States. The project involves a series of dams and canals intended to store, regulate and distribute the waters of the Snake River, with electric power generation as a byproduct. Today, the water irrigates more than a million acres (4,000 kmÂ²) of otherwise arid land, producing much of Idaho's potato crop. 1970 AD: First female land surveyors registered in Illinois. 2009 AD: Johnson-Western Surveying LLC was formed.